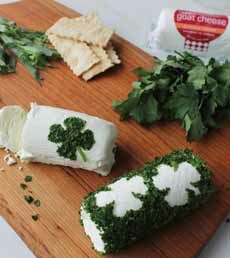 Add a little luck of the Irish to cheese and other foods, by creating a shamrock garnish made of herbs. You can apply the same technique to other themes: Mother’s Day and Valentine’s Day hearts, stars for Christmas, Independence Day and New Year’s, pumpkins for Halloween, and so forth. You also can use edible glitter, which provides no flavor but adds gorgeous color. For Christmas, make separate stencils for green herbs and red spices. Red spices for hearts: cayenne, chile flakes, kebab masala, paprika, red tandoori spice blend. Yellow spices or gold glitter for stars: coriander seeds, cumin, curry, fenugreek, ras el hanout, turmeric. Orange spices for Halloween and Thanksgiving: Cajun seasoning, tandoori masala. Select any cheese(s) that’s moist enough to hold the herbs: burrata, cream cheese log, goat cheese log, feta, fresh mozzarella, paneer, queso panela or ricotta salata. Print out the shamrock stencil (or other design) here. Print out a few copies for cutting practice. You can make a regular stencil or a reverse stencil, both shown in the photo. *Blend two or three herbs: dill, chervil, chives, parsley or tarragon, etc. Shamrock style with a stencil (photo and recipe idea courtesy Vermont Creamery). 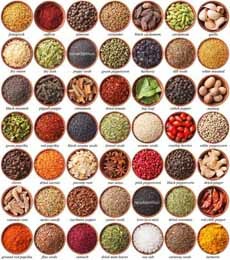 Spices and herbs provide colors for any occasion (photo courtesy Renegade Expressions). 1. CUT out the shamrock stencil and press it firmly onto the cheese. 2. PRESS the herbs into the stencil. You can place a piece of plastic wrap over the herbs for easier pressing. 3. GENTLY PEEL off the plastic and stencil. Clean the lines with a pointed tweezers, as needed. 4. SERVE with bread, crackers and fruit (apples, grapes, orange/mandarin segments, pears, etc). Instead of coating apples or pears in lemon juice to keep them from browning, coat them in calcium-fortified 100% apple juice. Here are more ways to keep fruits from browning.